Most epiphytic bromeliads in Mexican tropical dry habitats are in the genus Tillandsia. 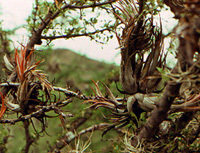 Epiphytic plants grow on other plants, usually but do not parasitize them. The central leaves of this species turn red when the flower spike emerges, probably helping to attrack pollinators. These plants are growing on the twigs of a large shrub in the genus Lycium, a member of the tomato family Solanaceae.